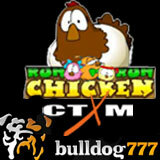 24 August 2012 (London, UK) – Bulldog777 Casino has just added a selection of new games from CTXM to its already impressive line-up of Microgaming no-download casino games. The new instant-play games offer industry-leading tournament technology so players can look forward to lots of slots tournaments and table game tournaments in weeks to come. CTXM is one of the world’s leading casino games suppliers and provides fresh and exciting games that are bursting with vivid graphics and rich functionality. Some of their most popular new titles now available at Bulldog777.com include World Cup Soccer Spins, Freaky Fruits, Summer Dream, Spin the World, Olympic Slots and Run Chicken Run. Card games include European and American Roulette, Craps, Sic Bo, Baccarat and several versions of Blackjack including one with a large progressive jackpot. Bulldog777.com already offered a wide choice of no-download games from Microgaming, including the new The Dark Knight Online Slot, as well as popular table and card games. It now offers one of the biggest selections available. Bulldog777 has an integrated wallet system so players can use the same account in its poker room which is on the recently upgraded Merge poker network. They can also bet on over 4000 live in-game betting events in its sportsbook. Bulldog777.com offers customer service in Russian and English.